It was a warm September evening across the rolling pastures of Kentucky’s bluegrass region. In Commonwealth Stadium in Lexington, Kentucky, more than 60,000 fans had gathered on a pleasant Saturday evening to cheer on a scrappy University of Kentucky (UK) Wildcat football squad, which was in the process of defeating Ole Miss en route to a 2006 season culminating in the team’s first bowl victory in twenty-two years. Those fans had also gathered to honor six new members of the UK Athletics Hall of Fame. At halftime, the selected inductees, along with family members, journeyed onto the beautifully manicured field and stood as public-address announcer Carl Nathe read through a brief summary of each honoree’s accomplishments and the crowd welcomed the group into Wildcat immortality. Among the six members of the 2006 class, the second Hall of Fame class in UK history, was Claude Sullivan. 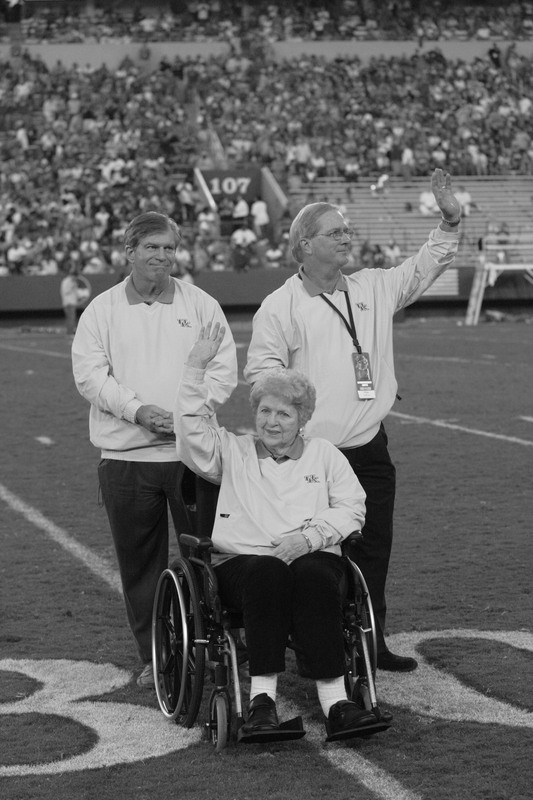 The most important people in Claude Sullivan’s life—his sons, David and Alan, flanking the love of his life, Alyce—walked across the lush grass, smiled, and waved to the crowd in recognition of the applause that greeted them. Announcer Nathe summarized a career that included broadcasting four Wildcat National Collegiate Athletic Association (NCAA) basketball championships, announcing many of the greatest moments in Wildcat football history, covering four seasons of Cincinnati Reds baseball, and winning the Kentucky Sportscaster of the Year award for eight years running over friendly competitor Cawood Ledford. On this occasion, Claude was joining not only his perceived rival Ledford in the Hall of Fame, but also close personal friends such as Wallace “Wah Wah” Jones, Paul “Bear” Bryant, and Adolph Rupp. The only person missing on this lovely late-summer evening was the subject of the honor himself—tragically now gone for almost four decades. UK Athletics Hall of Fame induction ceremony, Commonwealth Stadium, 2006: David, Alan, and Alyce Sullivan. Courtesy UK Public Relations. Some of the younger fans in the stadium that night wondered, “Who’s Claude Sullivan?” Although the honors that surrounded Sullivan are astounding in length and breadth on the printed page, they cannot fully convey the significance or excellence of his career. The timing of that relatively brief career was significant—Sullivan found himself at a very young age broadcasting some of the greatest and most meaningful moments in Wildcat history. Alongside his four NCAA Championship broadcasts, he covered two other basketball squads that were as interesting and memorable as the title squads. He covered four Wildcat bowl squads, including the best team in the history of the program, and broadcast what may forever remain the greatest game in Wildcat football’s century-plus history. Sullivan broadcast baseball at the time when it was essentially beyond challenge as the nation’s greatest athletic pastime. He covered baseball players whose names resound as giants today—Aaron, Mays, Clemente, Musial, and Rose, among many others. There were also surprises—or accomplishments that only those well versed in radio history or inside Claude’s closest circle of family and friends might know. But all of these accomplishments merely skim the surface. Fellow UK broadcaster Ralph Hacker appreciated the hidden depth behind Claude’s accomplishments. When Sullivan’s career was near its unexpected end, Hacker was just getting started as a young announcer. Hacker’s career later included broadcasting two Wildcat NCAA titles and many seasons of football. However, neither the passing of years nor the ascendency of his own broadcasting star dulled Hacker’s enthusiasm for his mentor. Claude Sullivan was a radio play-by-play man, one who described the action in such vivid detail that you could feel the bitter bite of the cold winter wind during a football game, you could smell the popcorn in the stands . . . you could feel the “hit” of each play. His emotions were that of a fan, his reporting of every game . . . professional. Before the terms coined by Jim McKay, through the words that Claude Sullivan used, he let the fans feel the “joy of victory and the agony of defeat.” He was for many . . . the voice. However, when asked how Sullivan most impacted his own life, Hacker recollected a single specific incident—one he recalls in speaking engagements across the state and the nation—and words that Sullivan shared with him and that he has shared with multiple generations of announcers and fans. The incident Hacker recalls occurred sometime in 1967. Cancer was ravaging Claude Sullivan’s body, and although the public knew little of the extent of that battle, it is safe to say that Claude was very aware of his own mortality—if not aware of exactly how short his remaining life would be. As a young broadcaster, Hacker was probably not routinely offered the counsel of an established colleague who had been named Kentucky Sportscaster of the Year eight consecutive times. His interest definitely awakened, Hacker focused in tightly on what Sullivan told him next. Claude gave me this piece of advice I’ll never forget . . . what you have to do in order to survive is you have a hub. Claude went on to describe that [on the] hub will be [sales at] WVLK. . . . That’s one spoke, and then you do some programming at WVLK, that’s another spoke. You’re doing ball games at WVLK, that’s another spoke, and then [you] go on and do regional television. Claude described building yourself a wheel by adding spokes to the hub, and if any of those spokes breaks, the wheel will continue to roll until you can get another spoke to replace it. Building a wheel was not just an isolated piece of advice that Claude Sullivan shared with young Ralph Hacker on that afternoon in 1967. It was a personal philosophy that enabled a meteoric rise and an amazingly full, if agonizingly brief, life. The idea of the wheel appears to have sprung from a childhood tragedy that caused young Claude to reevaluate his life and for a time threatened to end that life before he had ever picked up a microphone. From that initial battle, Claude Sullivan learned of life’s duality—of the great achievements and beautiful moments that are possible, but also of the unpredictable and at times even cruel nature of fate or circumstance, which can topple ambitions, rearrange plans, and ultimately leave any person without time before expected. In forty-two years of life, Claude Sullivan reached personal and professional highs that defy the imagination. He also scratched, suffered, and worked relentlessly. From the chaos of life, Claude would impose order. He would build a wheel. And what a wheel it would be. A loving and supportive family—first the one into which he was born and later the one that he would establish with his beloved wife, Alyce, and their sons, David and Alan—always functioned as the hub of the wheel. Next came the broadcasting. Sports was always a central part of Claude Sullivan’s life, and that interest manifested itself in years at the top of collegiate sports, horse racing, and Major League Baseball broadcasting. Spokes were added, and spokes were taken out. Claude would add where he could and survive losses where he could not or where one activity subsumed another. But there was always more. Broadcasting innovations, production improvements, and network formation again placed Claude ahead of his time and showed the man behind the accomplishments—always looking for more and better ways to impose his ambition on his world. This is not to say that Claude Sullivan was single-minded. His quick and easy friendship and the deep and abiding love he shared with his family speak otherwise. For that matter, his adventures in international travel and even dalliance with something like espionage will amaze even many who knew him well. The wheel was always in motion—always rolling on, with newer and stronger spokes, and carrying Claude Sullivan to places that he could hardly have dreamed of. It is no mistake that Ralph Hacker recalls Claude saying that “what you have to do to survive” is build that wheel. Perhaps the strongest testimony to the wheel of Claude Sullivan’s life is that it still spins in the decades that Claude has been gone. What Claude experienced as life is now, for the most part, history. Step back into that history and get to know Claude Sullivan—the man, the father, the businessman, the friend, the broadcasting legend. Watch the wheel be built and strengthened, the spokes added and multiplied. Marvel at a great life. For those who are too young to have witnessed those glory days, let Claude transport you once again to the best seat in the house. And watch the wheel continue to roll.